Hollywood-legend-turned California Governor, Arnold Schwarzenegger, has left Bulgaria after finishing shooting on location the hit action movie The Expendables 2. The news was reported Saturday by the press center of the Nu Boyana film studios, informing that the action hero has delivered a moving thank you speech upon his departure. He had thanked the entire team for their dedication and professionalism which made it possible for the star actors to do their job. Schwarzenegger said the Bulgarian team had been one of the most professional and talented ones he had worked with through his entire movie career, stressing he felt great in Bulgaria and in the Nu Boyana studios. During the past week the shots took place in Bulgaria's second largest city of Plovdiv. 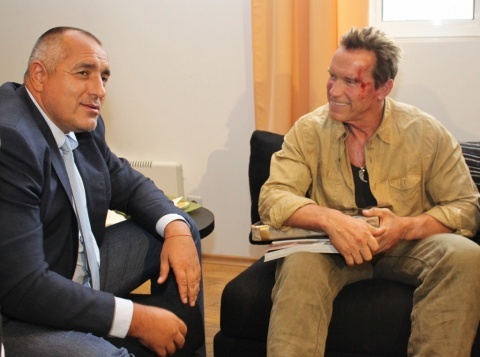 On Monday, Bulgarian Prime Minister Boyko Borisov visited the Nu Boyana film studios to meet Schwarzenegger. The meeting was also attended by Culture Minister Vezhdi Rashidov and Bulgarian football star Hristo Stoichkov. The movie legend appeared in film make-up and costume and invited Borisov to visit him in California and to become part of The Expendables 2 team, which the PM declined referring to his duties as country leader. He received as a gift the original sword from another hit movie – the super-production Conan the Barbarian while Schwarzenegger was bestowed with an antique handgun, dating from the historical 19th-century Bulgarian April Uprising against the Ottoman rule. In addition to Schwarzenegger, Sylvester Stallone, Chuck Norris, Bruce Willis and Jason Statham have also arrived in Bulgaria for the shooting of the "The Expendables 2" at the Nu Boyana Film Studios. Movie director, Simon West, has said in an interview for the media that he was also charmed by Bulgaria and the high quality of work that is done by Nu Boyana Film.